One thing that Canon emphasizes is that the WPA Federal Music Project didn’t emerge ex nihilo. He outlines the whole history of relief measure taken during the Depression era. The FMP had a precedent in the Federal Emergency Relief Administration (FERA, enacted in 1933) which significant;y impacted aid to musicians and the Orchestras in which they played. As Canon states, “[t]he FERA period can best be understood as a transition from private and state administration of relief to federal administration under the WPA” (Canon 1963, pg. 21). While not the first nor the last relief measure during the period, FERA is the one that contributed the most (through state-aid grants) to Orchestras in the pre-WPA period. Orchestras survived the Great Depression virtually unhurt. The big orchestras made cutbacks, but not drastic ones. New orchestras were created. Half of all orchestras that existed in the US in 1940 were founded during the depression, despite 25% unemployment and a huge drop in industrial production. Which could hardly have happened if classical music had been in crisis. “Half of all orchestras that existed in the US in 1940 were founded during the depression” is the point of contention. Half would amount to 150 of the estimated 300 orchestras in existence. This, as I noted in a facebook post of Sandow’s comes from the Grant/Hettinger book, “America’s Symphony Orchestras” (Grant and Hettinger 1940, pg. 23). Grant and Hettinger’s source comes from Pierre Key’s Music Year Book 1938 which would cover up to the year 1937. Grant and Hettinger states there were only 36 WPA Orchestras which I’m assuming was the number listed in the Key’s book (which I should have in my hands in a few days), but by March1937 Canon (1963, pg. 162) states that there 48 symphony orchestras and 110 concert orchestras in operation that were founded by the FMP. By December of 1938 that number had already dwindled down to 38 symphony orchestras and 89 concert orchestras. His source, again, is the Record Group 69. Which implies that Grant and Hettinger, and the Key Music Year Book, are incorrect about the numbers. And what we can see from the Hartford Symphony case (as well as some of the other Orchestras mentioned by Canon), many Orchestras founded during the period may have begun as FERA supported orchestras, moving over to FMP funding, then to a private model. So we don’t know how many of those 150 orchestras would never had been founded without Federal support from either FERA or FMP since WPA orchestras are only those actually founded by the WPA–not necessarily those who had complete funding by the WPA but were originally FERA founded (or even privately founded ones that moved to partial or full federal funding during the Great Depression). The joint sponsorship began in 1936 according to what I quoted above in Canon. The Hartford Symphony (the the Hartford Civic Concert Orchestra) was founded as a FERA orchestra in 1934 and then was an FMP orchestra in 1935 (when the WPA started). What we are left to question is how was the Hartford Symphony (and others with similar situations) counted in the Music Yearbook and in Grant and Hettinger. Since there seems to be a distinction made during the period of Symphony Orchestras and Concert Orchestras (as we saw from Canon above) does that mean the Hartford Civic Concert Orchestra didn’t count until it evolved into the Hartford Symphony Orchestra? This would be a very misleading accounting measure since the orchestra was already in existence as a fully funded federal organization and the transition into a private organization doesn’t automatically make it one of the 150 privately funded orchestra formed during the 1930-1940 years, right? Did the Music Year Book make a distinction between Symphony Orchestras and Concert Orchestras? In the end, did that distinction even matter? 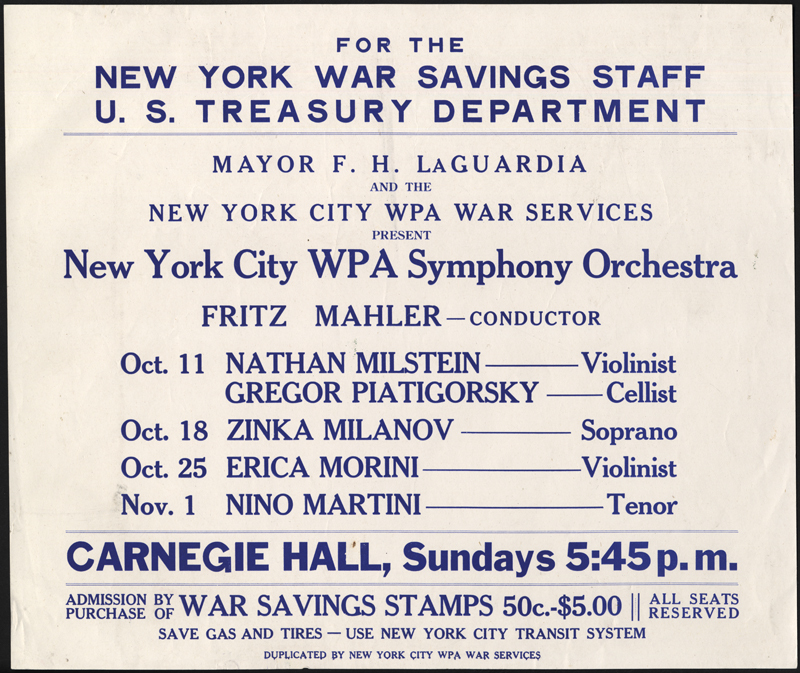 Some of the WPA Symphonny Orchestras had as few as 35 players, while a number of the WPA Concert Orchestras had as many as 50 and repertoire performed as often as not reflected the size of the ensembles. If the size weren’t the only determinant of the distinction between a Concert versus Symphony Orchestra then we could simply say that Federally founded orchestras during those depression years in question could have reached 158 (48 Symphony Orchestras + 110 Concert Orchestras). The other question, since we know that the contraction of the WPA after 1937 (hence the lower number of WPA Orchestras in 1938 as opposed to 1937), is how many orchestras ceased operation during those years from 1930-1940. Stating that half of the estimated 300 Orchestras in 1939 formed during the 1930-1940 period means a lot less if we don’t know how many orchestras folded during that period. There are just far too many ways to interpret that figure in the Grant and Hettinger book to come to the simplistic conclusion that there was no Orchestra crisis during the Depression era. Bindas, K. J. (1988) All of this music belongs to the nation: The Federal Music Project of the WPA and American cultural nationalism, 1935-1939. Ph.D. dissertation, The University of Toledo, United States — Ohio. (Publication No. AAT 8909905). Canon, C. B. (1963) The Federal Music Project of the Works Progress Administration: Music in a democracy. Ph.D. dissertation, University of Minnesota, United States — Minnesota. (Publication No. AAT 6307915). Findley, J. J. W. (1973) Of Tears and need: The Federal Music Project, 1935-1943. Ph.D. dissertation, The George Washington University, United States — District of Columbia. (Publication No. AAT 0289452). It seems to me that you’ve been going to extraordinary lengths with these blog posts to prove Sandow wrong (or potentially wrong) on a single point that, frankly, isn’t that pivotal to the questions that orchestras are facing today. This whole argument about whether the “crisis” is just a fatalistic lens on a perpetual state of classical music or whether is something new to be reckoned with is frankly irrelevant to the members and administrations of symphony orchestras in Honolulu, Detroit, Philadelphia, Minneapolis, Nashville, etc. Certain orchestras are, undoubtedly, in crisis. Others seem to be weathering recent difficulties fairly well. For many, you’ll get a very different perspective based on which stakeholder you ask. It seems to me that this particular historical argument is all about defending structural (read: operating budget) changes or the status quo, or defending program innovation or the status quo. All with shadow arguments of questionable relevance. Obviously, I don’t see it that way, Aaron. It seems to me that the infrastructure (economic, cultural, and legislative) of the US has more to do with the sustainability of an organization than anything else. I don’t believe that, say, Sports and Popular Music are inherently more popular (or accessible, or relevant) than Classical Music is so have hypothesized other external factors (like the Sports Broadcasting Act or recording technology) have as much to do with the success (such that it is) of the former than anything else. I think the revenue boost that came from the WPA and the Ford/Rockefeller grants insulated the Classical Music field from those external factors and that we know so little about the WPA initiatives and how that shaped the industry by exposing so many Americans to classical music through education efforts, radio broadcasts of FMP records, and of course the live concerts. Reading about the differences between the WPA orchestras and private orchestras I’m also struck by how concert seasons of the the rising number of non-Western orchestras (e.g. New York Arabic Orchestra, Michigan Arab Orchestra, Seattle Chinese Orchestra) echo the latter during that period as well as smaller regional orchestras of today. As the new music ensemble I co-founded a couple years ago just doubled in size this year I’m also interested in this issue from the practical side–and really, I’ve always been interested in it from that side especially since the WPA had pushed new music and supported American composers. And really, the whole crisis issue is as much of a red herring as the age of audience issue.